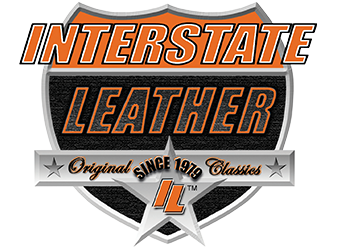 Interstate Leather, a brand extended from Carroll Companies, Inc., prides itself on providing you motorcycle leather jackets, chaps, and vests that are all unmatched in quality, construction, and price. Each motorcycle leather product is designed and made with your taste, comfort, and convenience in mind. Whether you're hanging out around the corner or touring out on the open road, Interstate Leather performs. Sheplers.com showcases a variety of Men's Interstate Leather Jackets, Leather Chaps, and Leather Vests. Choose from classic Interstate Leather Motorcycle Jackets to bomber style Interstate Leather Jackets. Complete your biker attire with Interstate Leather Motorcycle Chaps. Leather Chaps are available in regular and big sizes. While you're shopping don't forget her Interstate Leather wardrobe. Women's Motorcycle Jacket is cut and designed with a feminine silhouette just for her. Interstate Leather combines contemporary good looks with the protective features motorcyclists' need and love.